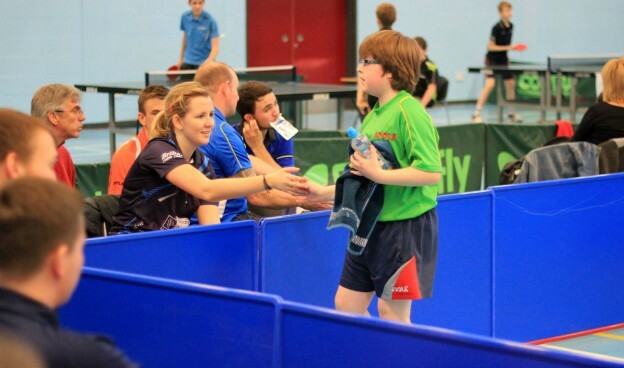 North Ayrshire Open 2014 was held at our home venue of K:A Leisure St Matthews on November 8th & 9th and what a fantastic weekend of table tennis it was. 138 competitors played in 15 different events with a total of 570 matches being played over the weekend. We had an international entry on the Saturday for the Men’s and Women’s singles with Cheng Meng Sung (Taiwan) being top seed in the Men’s and Lynda Flaws (Glasgow 2014 Commonwealth Games player) topping the bill in the Women’s event. All results can be viewed below and pictures from the event can viewed through the link. A big thanks to the players, organisers, volunteers, parents and sponsors for making this year’s North Ayrshire Open bigger and better than ever. * Jill Taylor S / F Junior Girls. * Patric Hollywood S / F u11s. This entry was posted in Latest News on 23rd February 2015 by Chris Main.